What's the Best Service for Streaming Live Local TV? More Americans are canceling their cable subscriptions every day. But can internet-based TV services stream enough local TV stations to make them worth the money? We analyzed the local coverage of the six biggest streaming services in America’s thirty largest markets to find out. Who's missing the World Series? When Does This Mess Get Fixed? An HDTV antenna can pick up dozens of local TV stations’ over-the-air broadcasts free of charge. The US Federal Communications Commission has an easy-to-use station reception map that will tell you what stations you could get. People in Manhattan, for example, could get three dozen local TV signals – with the right hardware. None of the major streaming services, however, carry all of these local TV stations. There are dozens of other local TV stations that you won’t find on the streaming services. Public TV is the biggest example. None of the streaming services carry PBS-affiliated TV stations. Other local TV networks like sci-fi focused Comet and latino-focused Estrella don’t get carried by the streaming services either. Note: You can find a detailed breakdown of the local TV channels that each streaming service supports (by specific market) towards the end of this article. 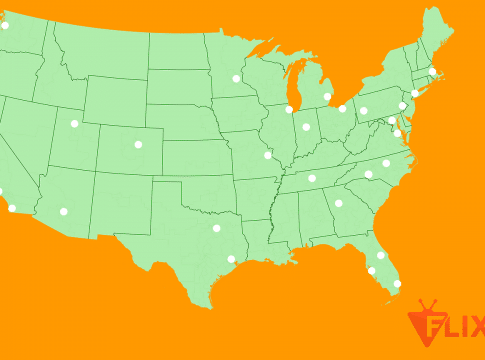 In this review we looked at how many of these local stations each streaming service actually carries in the thirty largest TV markets in the United States. What we found is that local streaming is very much a work in progress. Some streaming services do better than others, but no streaming service is perfect. YouTube takes top marks in our analysis. It has obviously put a huge effort into cutting the deals it needs. It carries all of the Big 4 networks in most of the markets it serves. (Tampa, Portland and the Research Triangle are the only exceptions.) Overall, half of the markets we looked at get two-thirds or more of their local stations on YouTube TV. Related: YouTube TV vs. Hulu TV – Which is the Best Live Streaming Service? Hulu with Live TV isn’t far behind in overall coverage, but it can only stream local broadcasts of the Big 4 networks in ten of the thirty markets. No matter which way you look at it, Sling TV scored pretty badly. In twenty of the top thirty markets, it offers no more than one of the national networks. Five markets don’t get any of the national networks. Sling TV subscribers are particularly out of luck when it comes to streaming the Big 4 networks. Twenty-two markets only get one of the local stations. Eleven markets don’t get any. That’s a shame since Sling TV is a decent replacement for basic cable. We criticized Sling TV in our review for its “a la carte” marketing, but the combination of available content and price make it a good value. If local TV stations are a priority, however, you should stay away. It should be no surprise that people living the largest markets – especially those with a major media presence – have more choices when it comes to streaming local TV. Houstonians are blessed with a wealth of choices when it comes to streaming local TV. Most of the streaming services include a good range of local TV stations. Three out of the six streaming services (Hulu with Live TV, PlayStation Vue and YouTube TV) offer all of the Big 4 networks. Astros fans, in particular, should be happy since FOX’s World Series broadcast streams on all six services. Rounding out the top of the list are Chicago, Los Angeles, New York City, Philadelphia and San Francisco. Four out of the six services in these major media centers have the local ABC, CBS, FOX and NBC broadcasts. That means Dodgers fans in LA get to stream the World Series also. These five markets have surprisingly little in common that would explain the poor coverage. They are spread across the country. They all have major universities and industries. Many of them are significant tech centers. Who’s missing the World Series? Baseball fans in Los Angeles and Houston can stream the local FOX broadcast of the World Series, but people living in other markets aren’t so lucky. Pittsburgh’s in the worst shape as only PlayStation Vue and YouTube TV offer local FOX streams. Baltimore, Boston, Nashville and Portland aren’t much better off with only three services carrying FOX. Some of the streaming services carry the MLB channel, but availability often depends on having the right combination of subscription and premium packages. The sheer number of players in the TV business makes this a really tough question to answer. If it was just a matter of each streaming service cutting a deal with each network, then there wouldn’t be a problem. The thing is, the networks can’t make the call. Federal Communications Commission regulations limit the number of local TV stations a major network can own outright. ABC, CBS, FOX and NBC each own about a dozen local stations. The hundreds of other local stations are owned by large media companies or small independent operators. What this means for streaming is that each service has to cut a deal with each network – and then has to negotiate with each of the station owners to get their local feed onto the internet. For now, the only guaranteed way for cord-cutters to get local TV stations without a cable subscription is to use an over-the-air HDTV antenna. As discussed earlier, we limited our analysis to the Big 4 networks – ABC, CBS, FOX and NBC – as well as other networks with large national broadcast footprints: Univision, UniMás, Telemundo, The CW and MyNetworkTV. Wikipedia’s list of US television markets summarizes the state of major network coverage across all 210 television markets in the United States. We used the streaming services’ own look-up tools to check availability of local network streams in the thirty largest of those markets.